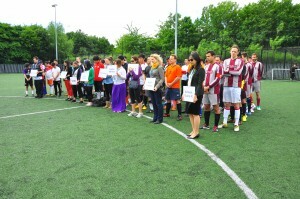 As the teams gathered for the opening ceremony, Tony and In Ki felt proud as well as a strong sense of accomplishment. They had managed to take the game they love most, football, and to use it as a mean to an end, a tool to raise money for people who needed it badly. Their achievement was two-fold though – as they had overcome tight time and logistical obstacles to organise a charity 7-a-side football tournament in just over a month. Arriving from China and Korea respectively, Tony Liu and In Ki Choi had decided to complement their undergraduate degrees with a postgraduate degree in the sport management field. They are both Master’s Degree students in the Sport Management and the Business of Football programme at Birkbeck, University of London. On April 20th 2013, 01:02 London Time, while Tony and In Ki both were in their first week of the Summer Term, a disastrous earthquake of 7.0 magnitude struck China in Ya’an, a town in the Sichuan Province. The disaster resulted in at least 200 deaths, 15,000 badly injured and tens of thousands made homeless. The deadly earthquake took away countless lives, homes and families. When the disaster hit the small town, Tony and In Ki decided that they must do something to assist the people of Sichuan. “I had started my own research into the various aid initiatives that had sprung up following the disaster, and I realised that nothing was going on in London,” says Tony. “I talked to In Ki and it was clear to us that since we are sport management students, nothing is more appropriate than a sport related fund-raiser”. In which tools you used to promote the event? “Initially we targeted students and therefore most of the promotion was made through university channels i.e. 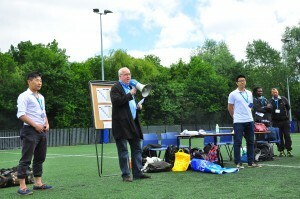 students’ unions, their messaging boards and websites”, says Tony. “But fearing it wouldn’t be sufficient to attract enough teams, we used public media channels, such as Birkbeck College’s channels and obviously the Birkbeck Sport Business Centre’s website and Twitter account,” he adds. The main challenges they faced were time and money. They wished to organise the tournament as soon as possible. And because they wanted to maximise possible revenues to be made as donations to assist the earthquake victims, they also had to be as cost-effective as possible. “We mostly worked together, trying to optimise the limited time we had. We separated our roles where it was relevant to our previous experience and background; In Ki was responsible for the promotion of the tournament including copyright and I was in charge on the communication side of the event including the negotiations with the teams’ captains, sponsors and partners,” Tony says. The Birkbeck Sport Business Centre (BSBC) played a key role in the organisation of the event because, as Tony explained, since they had a mere two weeks to set it all up, “it simply wouldn’t have happened without the help we got from the Centre and in particular from Sean Hamil – one of the Centre’s directors.” In Ki explains that the BSBC helped in several ways: “Firstly, BSBC helped us to promote the event so we could maximise the number of teams involved. Secondly, the BSBC set up the on-line team registration process. Thirdly the BSBC then helped us communicating the event to the wider public. And finally Sean introduced us to Rob Park from the Birkbeck Students’ Union,” In Ki explains the key role of the students’ union: “The student union at Birkbeck supported us in promoting the tournament, printing event materials, and organising the payment of the final payment to the earthquake relief charity.” And under the auspices of the Birkbeck Sport Business Centre and the Birkbeck Students Union, “the money raised from the tournament was donated to the victims of the earthquake disaster through the Chinese Education Foundation, which is an official charity organisation in China,” continues Tony. “In terms of the funds raised, we exceeded our expectations. We aimed at raising £1,000, but managed, after all expenses, to donate £1,320,” says In Ki. 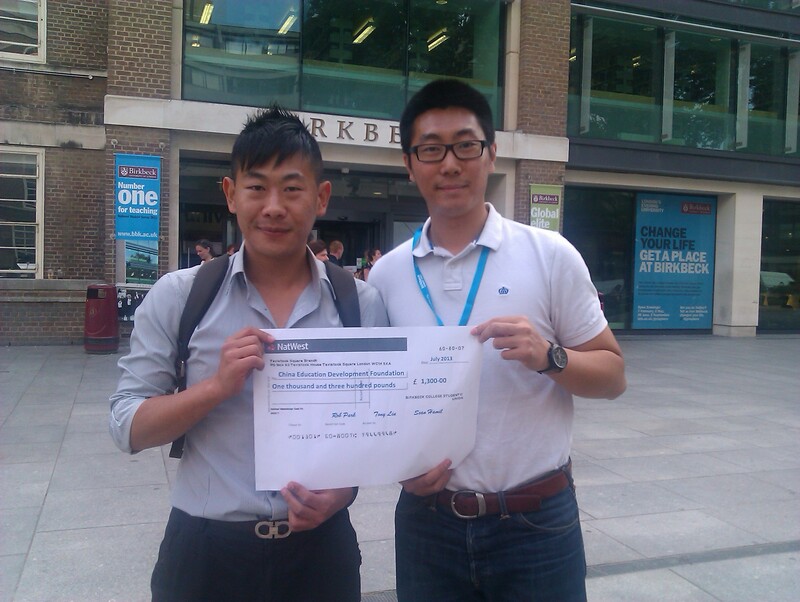 “We researched similar charity activities set up with the intention of helping Sichuan and realised what should be our target and while we were more than happy to surpass it we are particularly grateful to the Birkbeck Sport Business Centre and the Birkbeck College Student Union for their donations to the fund. 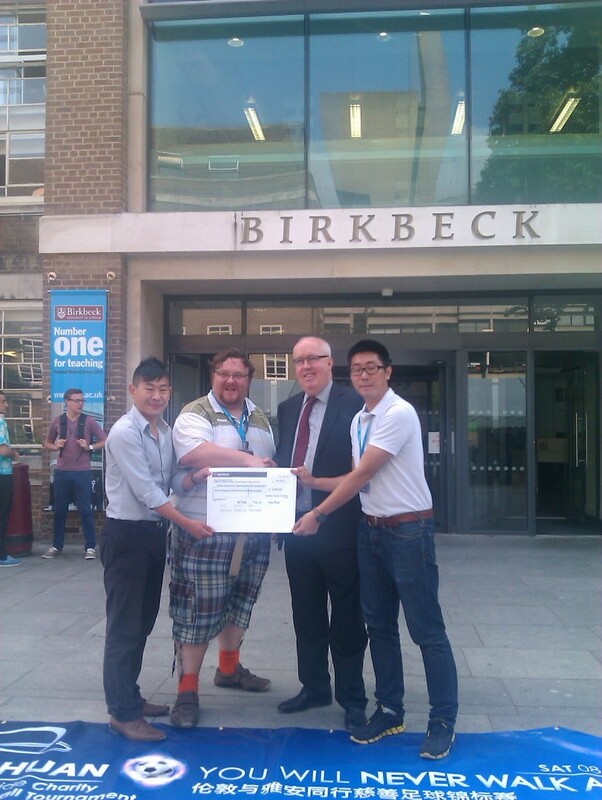 In Ki, Birkbeck Students’ Union’s Rob Park, Sean Hamil and Tony presenting the donation. What was your best experience from organising this event? “It was impressive and heart-warming to see all the other Birkbeck sport management students asking if we needed any help once we talked to them about our idea,” Says In Ki. “The guys were amazing! Three days before the tournament, we gathered, all of us together, and discussed the roles and responsibilities of each of the volunteers involved such as the media and administration teams,” Tony reinforces this point: “The fact that we are all students in a sport management programme meant that we all love sport. That was extremely valuable as all volunteers, our fellow-students, were passionate and motivated about the event at least as much as we were and for that we are grateful,” he says. What lessons did you learn from organising the event? “Sometimes, as students, you spend most of your time learning theoretical concepts. There is a need, I think, for students to allow themselves the time to apply these concepts in practice, and this is what we did,” says In Ki. “In organising this tournament, not only did we apply general business skills acquired elsewhere, but also, we saw for example, how football can have a social impact, how football can contribute to society, which is a central issue discussed in our studies,” adds Tony.